Here is Hannah, Chief Freikorps Archivist for Malifaux. She’s strictly part of the Outcast faction and I originally bought her when I was playing them, but as a Mercenary can appear in any crew. I really enjoy playing Hannah. She brings Arcane Reservoir to the crew which is pretty much always awesome, and also has a huge base and melee range. Her main trick is being able to Make A New Entry to copy Cast actions from nearby miniatures which opens up all sorts of entertaining options. In Neverborn she can partner up with Lazarus to copy the latter’s Assimilate action which itself can be then used to make Collodi take a sixth (!) AP with My Will. In practice, I never really got much value out of that approach (too costly in terms of cards and positioning) but it is funny. In Resurrectionists I’ve been having fun using Hannah with her sister, Anna Lovelace, who brings two excellent Cast actions in addition to being wonderful in her own right. Presumably this means that Hannah’s surname is also Lovelace though that isn’t explicit that I’ve ever seen. 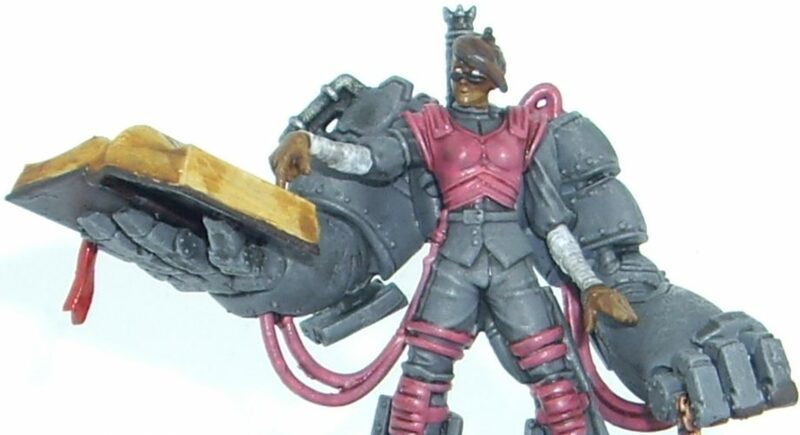 I painted Hannah in the same colour scheme of grey with pink trimmings that decked the rest of my Freikorps crew. My brushwork looks even less adequate on these large curved surfaces than normal, but nonetheless I did enjoy finishing her off after a long delay. This particular version of Hannah is not the standard release; I actually spent extra money to source the limited edition Through The Breach kickstarter version. I’m not normally bothered with limited editions, but this miniature is so much better then the normal version that I considered it worthwhile. I’m a bit late to the party but I would dedicate this miniature to both Leadballoony‘s Fembruary and Azazel‘s “Finish a neglected model” month. Both are truly excellent blogs and you should check them out. I think that I started painting Hannah sometime in autumn of 2016, so she definitely counts as a neglected model. I was also rather inspired by reading about Ann‘s own journey to completing these internet challenges. I hope that she enjoys her internet cookie or whatever one gets for this endeavour. As a final aside, Hannah is the name of my younger child. She doesn’t wear a giant robot suit though… yet. Next on the painting table: Seekers (for real this time). She’s very cool mate – thank you for your kind words & for supporting Fembruary! Thank you. Your blog is a real inspiration every time I check it. Keep up the good work! Thanks! I think if I ever unlock that secret I’ll consider buying a Space Marine army and showing off a bit. At least with skirmish games I only have to paint one of each miniature, no matter how bad a job I’m making of them. Best tricks are wider brushes, thinned paints, and lots of coats! Thanks! There seems to be a lot of people (at least in the blogs I read) that have been inspired by your monthly challenges. Pingback: Community Painting Challenge: Neglected February Round-Up | Azazel's Bitz Box. That’s a really nice shade of pink, almost like bubble gum. I also like how the grey turned out. It looks like you might have very lightly drybrushed it, which works well to give it a worn metal look. Thank you! I long since realised that I’m happier painting unrealistic styles so even options that are meant to be professional soldiers get bright pink accoutrements when I’m in the mood. Pingback: Neglected Models February 2019: Community Painting Challenge | Azazel's Bitz Box.